Technology - Apple has released the third beta version of the latest update IOS 8.4 for developers. As with previous updates, iOS 8.4 beta 3 brings some development internally and cleaning of annoying bugs. 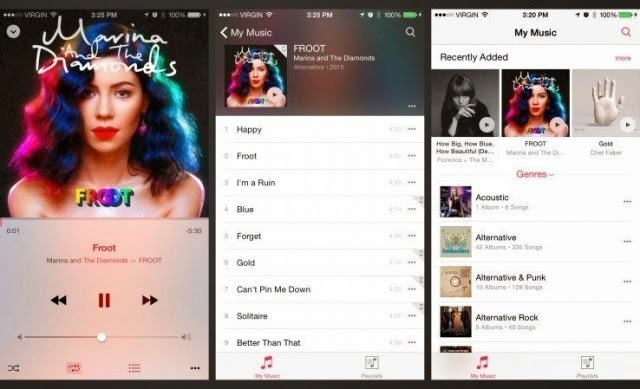 One thing that becomes the focus of Apple in iOS 8.4 will likely be struggling in the music player. iOS 8.4 beta 3 brings a new look for the music player and mini player. There are also features personalized playlists, global search, Up Next like the one in iTunes player, and others. Apple describes the new music player as something more powerful and more elegant than ever. This new design will make it easier for users to interact with his music collection. You can also connect to compatible speakers with AirPlay without having to leave the Now Playing view. iOS 8.4 beta 3 can already be tried by a registered Apple developers and to the public until now only available to beta 2. No Comment to " Apple iOs 8.5: New Features and Look! "